Another recipe from the Abel & Cole Cookbook, this is a lovely warming one-pot meal just right for a day when we have snow on the 31st March! Although, I actually made this last weekend before the snow. Heat a glug or two of olive oil in a large, heavy-based lidded pot, add the beef and brown it , then remove with a slotted soon. You may have to cook the beef in batches so the pot is not overcrowded. Once the beef is out of the way, fry the onions for 3-4 mintues. Return the beef to the pot and throw in the garlic, paprika and tomato puree and give this a good stir around for a few minutes. Add the stock and bay leaves and simmer with the lid on for 45 minutes over a very low heat. While the pot is boilling away, prepare your dumplings: mix the egg, water and salt together, and then add the flour, combine it and mix in the rosemary. Let the mixture rest for about 20 minutes or so. Once the pot has been simmering for 45 minutes, add the potatoes and more stock if needed - you need the goulash to be quite wet for the dumplings to cook. After about 15 minuites, when the potatoes are tender, add the dumplings by dolloping one teaspoon of the mix at a time into the pot. Return the lid and leave this to cook for 10-15 minutes. Season with salt and pepper to taste and serve with a dollop of soured cream. The recipe - most of the recipes in the book use mugs for measuring, which is great if you are a novice cook without much equipment, however, it would have been nice to have weights as well for those of us who prefer more accurate measurements. 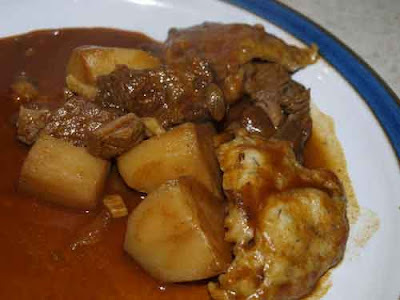 The goulash was absolutely delicious, the beef tender and the potatoes had soaked up all the lovely juices, I would be concerned if they were cut as small as was recommended that they would disintegrate but maybe not. The dumplings, on the other hand, were not as light and fluffy as I would expect from a dumpling. Whenever I have made dumplings in the past I've used suet, there are good vegetarian suets available too, but as this is a beef stew ordinary suet should be just fine. I'm adding a recipe below for the dumplings I've made before and never had a failure. Mix the flour, salt and pepper. Stir in suet & herbs, add just enough water to make a soft but not too sticky dough, shape into 8 small dumplings. Cook as above. Mmm...that's a lovely dish. I can take that as a meal. Thanks for sharing, Janice. It's really cold. Keep warm. I hope your holiday isn't being ruined with the snow. Still, make something as delicious as this, draw the curtains and keep the heating up... sheer perfection! I love goulash....make it with chicken though. the dumpling idea is just such a great addition to it! I am a measuring kind of cook but a glug or mug of something does sound homey! John loves rosemary and I add it to lots of dishes. I appreciate your evaluation and suggestions. Can you believe this weather we are having. I can imagine this would warm you up from the inside out! It looks beautiful, but I really appreciate your honesty about the dumplings. Delia it is :-). I wish we could see more honest appraisals in the blogosphere. That looks so good! Sounds like a great alternative to traditional beef stew.